The former head of the South American football confederation CONMEBOL, Juan Angel Napout, was sentenced to nine years in prison on Wednesday for his role in the sweeping FIFA corruption scandal -- a tough punishment the judge said should deter others tempted by easy money. 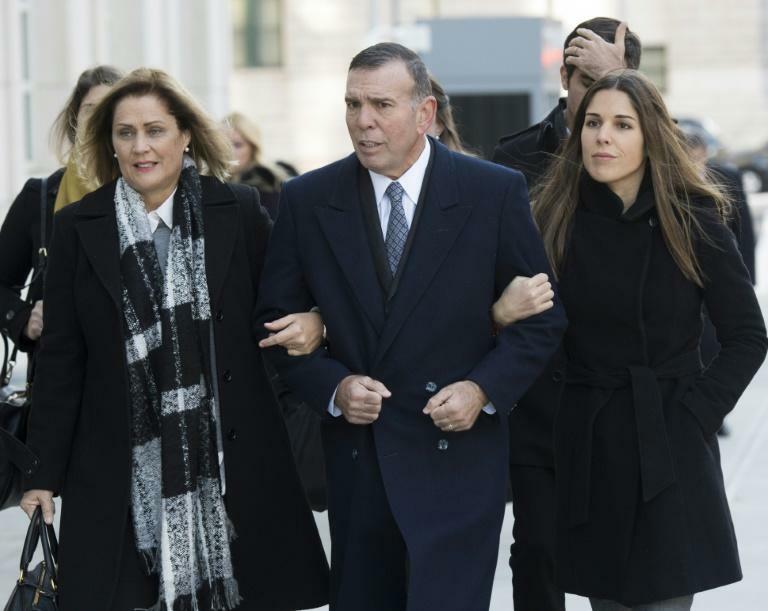 The sentencing of the 60-year-old Napout came just a week after the former boss of Brazilian football, Jose Maria Marin, was jailed for four years in connection with the same case. "There's a need for general deterrence because there was, and perhaps there is still, corruption in international soccer," federal Judge Pamela Chen told the courtroom as she delivered the sentence. Wearing a beige prison jumpsuit, Napout implored the judge: "I want to ask for your compassion. I want to ask for your mercy." But Chen said it was important to send a message "that you cannot steal millions in bribes from soccer organizations and go unpunished... that there are real consequences, that you'll go to jail and it won't be a slap on the wrist." Napout, who was also once the head of Paraguayan football, was also ordered to pay a $1 million fine and return the $3.3 million in bribes that he pocketed. He was found guilty on December 22 on three counts in connection with bestowing television and marketing rights for major events in exchange for lucrative kickbacks. He was convicted of racketeering conspiracy and two counts of wire fraud conspiracy, but was acquitted on two counts of money laundering conspiracy. "He had a hidden character, a hidden life... perpetuating the notion that he was a good guy but all the while taking bribes," Chen said during a marathon five-hour hearing. US prosecutors have lifted the lid on a quarter of a century of endemic corruption in the heart of FIFA, football's governing body, and on the largest graft scandal in the world's most popular sport. In total, 42 officials and marketing executives, as well as the sports company Traffic, were indicted with corruption crimes totaling more than $200 million. The 2017 trial of Napout and the 86-year-old Marin exposed not only the corruption, but the life of privilege, luxury and excess enjoyed by members of FIFA's executive committee. Prosecutors detailed a high-flying lifestyle for the sport's bigwigs: personal chauffeurs, private jets, luxury hotels, meetings in idyllic resorts in the Bahamas or Mauritius, and cruises on the Danube for families. Prosecutors said Napout deserved less mercy than Marin as he was "among the most culpable" among all those indicted. They had sought a 20-year sentence. He was "personally responsible for perpetuating and expanding the corruption of soccer at a time when it was most in need of reform," prosecutors said in a pre-sentencing memorandum. Napout received near-monthly payments from October 2010 until March 2015, totalling millions of dollars. He also tried to destroy evidence by attempting to get his computer out of CONMEBOL headquarters upon his arrest in Switzerland in December 2015. Napout did not testify in his own defense. His team argued that there was no concrete evidence that he had illegally accepted any money. Napout's defense attorneys had asked for a lighter sentenced for the father of three and grandfather, citing his "exemplary life" -- save for his conviction. "My husband is not perfect but then who among us is?" his wife Karin Forster told the judge. Of the 42 individuals originally indicted, three have since died and 22 have pleaded guilty. Marin and Napout were convicted, and one other -- Peruvian former football boss Manuel Burga -- was acquitted. Another 14 remain in their own countries, where they have been tried by local courts, are fighting extradition or are still free. The US investigation also precipitated the downfall of longtime FIFA president Sepp Blatter and his former heir apparent, Michel Platini.